After weeks of nothing, it has finally started raining here in North Carolina. Yes, I’m glad about the rain…but honestly, it makes exercising the dogs a bit of a challenge. Even if it weren’t still raining steadily, there would be the problem of mud. Janko is tall enough that only his paws get muddy, but Penny’s legs get filthy and Buckley is such a “low rider” that he becomes caked. So, tonight we have had to use some different strategies to get the pups the “exercise” they need. 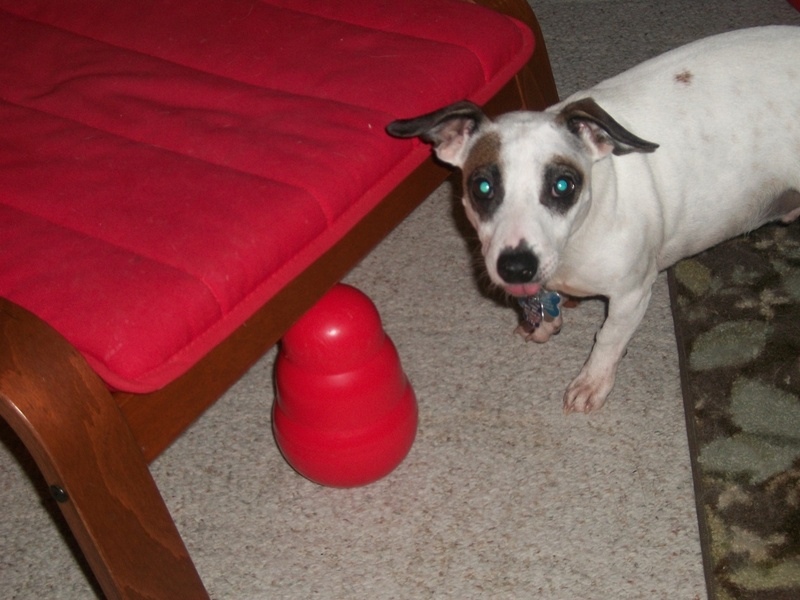 Buckley ate his dinner out of the Kong Wobbler. I really love this new toy from Kong. Buckley already enjoys pushing things around with his nose, and this cool toy pops right back up when pushed. Buckley loves it! Anyway, without the normal outdoor playtime, the dogs woofed a little more, Janko chased Penny around the table a bit and I’m hoping everybody settles down to sleep sometime soon! Why do they all want to drink out of a tiny green bowl?